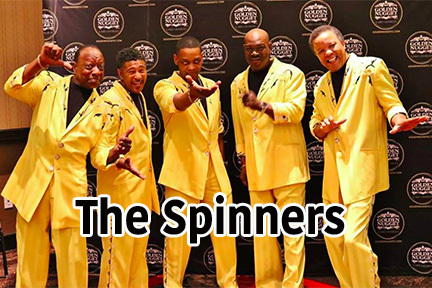 Most often thought of as a Motown recording act, the classic group sound of legendary R&B recording artists The Spinners has never lost its universal appeal. Throughout the years they have sold millions of records and topped both the Pop and R&B charts with smash hits like “I’ll Be Around” and “Then Came You.” Today, original member Henry Fambrough is joined onstage by lead singer Charlton Washington, high tenor Marvin Taylor, tenor Ronnie Moss, and bass singer Jessie Peck; a soul-infused 5-piece band, led by Keith Ferguson, backs them up. The Spinners have six Grammy nominations and have performed twice during the awards ceremony. Inducted into the Vocal Group Hall of Fame in 1999, they have also been awarded the Rhythm and Blues Foundation Award for their contribution to the genre. The group has performed for presidents, received a star on the Hollywood “Walk of Fame,” and has appeared in numerous network and cable television specials paying tribute to the music of the 70’s. In September 2011, 57 years after forming in Detroit and 50 years after “That’s What Girls Are Made For”, the group was announced as one of 15 final nominees for the Rock & Roll Hall of Fame, their first nomination.